To Cook julienne or not to cook. That's the question. To Cook or not to cook. That’s the question. Most of the people eat there julienne vegetables raw but that is not the only way. What about Sauté, boil, steam, deep-fried and also freeze. Lets get into the different technics. First and for most raw. Greens are the most nutritious when consumed raw or steamed. When served raw you can taste the real flavor of the vegetables. But not all people love raw vegetables. Some say they are just dull, flavorless and watery. Yes they are and no they aren’t. Which one is it? If you have good quality organic greens, if possible homegrown then they taste always supreme. They say you can really taste that these vegetables are organic. And so it is, there is no comparison between a southern homegrown zucchini and one grown in a industrial greenhouse . But we don’t always have the luck to eat organic so how can we pimp are raw greens. By mixing in some herbs, salt, peper. Also some good extra virgin oil combined with flavored vinegar can do wonders. Sautéing and woking are almost the same technic. The technic of sautéing is a method of cooking food, that uses a small amount of oil or fat in a shallow pan over relatively high heat. Ingredients are usually cut into pieces or thinly sliced to facilitate fast cooking. Woking is the same technic but with larger vegetables. If you make you’re julienne with a knife or a mandoline the pieces are bigger and beter equipped for woking ore stir-frying. Boiling is the easiest way to prepare julienne cut greens. Just put on a pot of boiling water and throw your vegetables in the pot. Simple enough you may think? What I love to do is first making a broth, chicken or beaf and for the vegans you can use vegetable stock. Add some small shaped pasta and right on the end of the boiling process add some julienne cut carrots, cucumbers, cabbage and turnips. Steaming preserves the most nutrients of all technics. This technics allows the greens to be cooked al dente which maximizes the flavor and nutrients. Just add a pinch of salt and peper and that’s all she needs. Maybe very tasty but sooo unhealthy. All basic flavor disappears and you get a fried taste instead. This is the most unlikely way I would prepare my julienne. The only way I consider this technic is to finish a dish with crispy bit on top of the dish. Did you say freeze? Yes freezing is also an amazing technic you can apply to fresh vegetables. What do you think about cucumber sorbet or carrot ice lollipops. 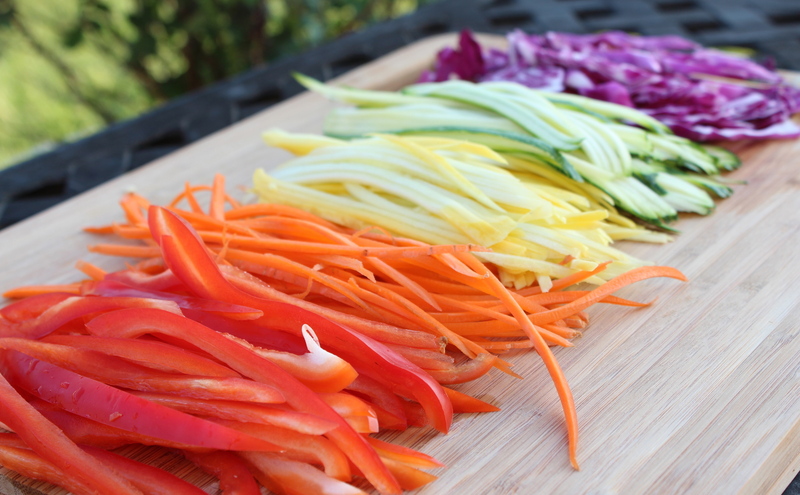 They have vibrant colors and the julienne shape lends itself perfect to be creative. Of course you can’t use salt like you use in other recipes. The trick is to boil the julienne greens first in sugared water. The someway you would make sweets. After five minutes boiling you have to oil them down. For ice popsicles you add the sugared carrots to water with the flavor of your choosing and put them in the freezer. For the sorbet you do the same but every fifteen minutes you stir the ice with the cucumber and you keep doing this for three hours. What is the best technic? For me is alternation importent so you don’t get tired from eating vegetables prepared with always the same technic. Eating greens has to be exciting. My top three is: raw, boiled and stir-fried.